During the International Astronautical Congress (IAC) in Bremen, Germany, Lockheed Martin (NYSE: LMT) announced their studying interest in flying commercial payloads aboard NASA’s Orion spacecraft — the market analysis is the first step toward the company’s vision of bringing commercial opportunities to deep space and fostering a thriving commercial marketplace beyond LEO. Lockheed Martin's Orion Group. Photo is courtesy of the company. 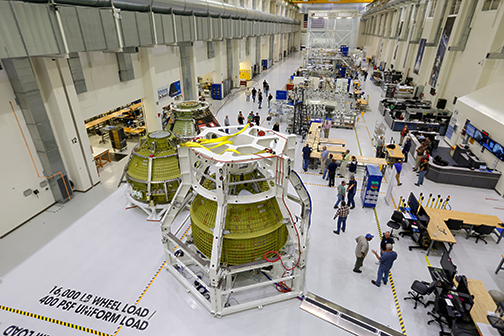 Lockheed Martin is the prime contractor for Orion, the world’s only spacecraft designed for human deep space missions that will take astronauts farther into space than they have ever gone before. The company is asking for domestic and international organizations to provide ideas of commercial payloads that would fly on one of Orion’s upcoming missions to the Moon and back. 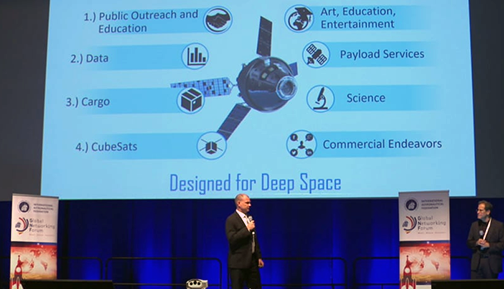 The payloads could be for science, STEM, art and entertainment, data or any other commercial endeavor. Payloads can be flown in the interior crew cabin or mounted to the exterior and can be static or deployable. Building on a proven and robust infrastructure in Orion, commercial access to deep space could be offered at a reasonable price and with a high degree of confidence in success. Commercial payloads on Orion are a natural starting point for future expansion into areas such as the lunar Gateway, landers, and even Mars spacecraft. By starting with Orion, industry could work with NASA and the international community to standardize the interfaces between national exploration ships and commercial payloads. Doing so will make it much easier to plug into future exploration platforms and give commercial providers a predictable and simplified design and engineering framework. Mike Hawes, Orion program manager and the VP of Human Space Exploration, Commercial Civil Space at Lockheed Martin Space said that access to the Moon and deep space for commercial entities opens up new worlds for all of us. It advances science, powers innovation, and inspires a new generation of engineers. This model works on the International Space Station in LEO and now, working with NanoRacks, Lockheed Martin is applying that same successful model to deep space. Jeffrey Manber, CEO and Co-Founder of NanoRacks, added that the company is proud in knowing exactly what commercial customer needs are for a growing number of in-space platforms and knowing how to deliver efficient services at a competitive price. That is why the firm sees this effort with Lockheed Martin as a win-win. Lockheed Martin brings unmatched capabilities in engineering, mission management, and deep space vehicle design. NanoRacks delivers a strong understanding of the market and an ability to match the needs of customers with a technical solution. Working together, the companies can prepare for future missions by creating unprecedented opportunities and building a solid foundation for commercial opportunities at the Moon and, one day, beyond.